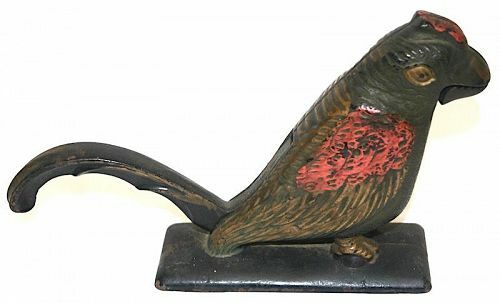 Scarce Victorian parrot nutcracker, cast iron, original painted surface, c.1880-1900. Size: 6 inches ht. x 9 inches length x 2 inches depth. Very good original condition. Lift to tail to open nut cracking jaws. Early American coin silver chamberstick, probably upstate New York, Albany area. Circa: 1800-1820. This heavy chamberstick bears unidentified pseudo-hallmarks on the foot ring that are listed in J.R. McGrew's book on maker's marks as probably upstate New York. Missing the snuffer & some minor blemishes. 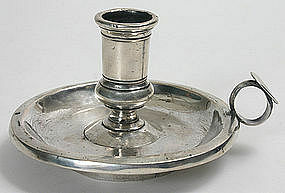 The heavy silver nut on the base is over an iron nut, which is probably a later replacement. Size: 6" x 5 1/8" diameter x 3" ht. Coin silver sugar spoon by J.A. Horne, Dover, NH with fluted shell bowl, c.1850, bright-cut decoration to handle with engraved initial 'W' in a cartouche. Size: 6.25" length. Excellent condition. George III sterling silver mug, London, 1765, with tapering sides and featuring an acanthus leaf capped double scroll handle and a stepped base. Marks rubbed and maker's mark indistinct. No repairs or erasures. Size: 3 3/4 inches ht. X 4 1/4 inches across handle X 3 inches diameter. Condition: minor bruising to sides. Coin silver table spoon by Frederick Marquand in the fiddle and thread pattern. Circa 1820s. Frederick Marquand worked in Savannah, Georgia and in New York City. From 1820-1826 he worked in Savannah and then relocated to NYC . It is likely that this spoon was manufactured during his time in Savannah. Size: 8 3/4 inches length. 2.85 troy ounces. 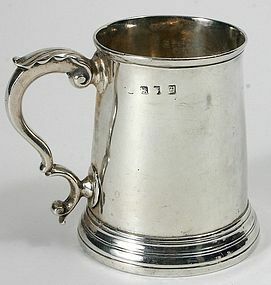 Engraved on handle with script initial 'F.' Excellent condition with no dings or wear to the bowl. Hallmarks are crisp and legible. English George I period pepper caster by important Huguenot silversmith John Chartier, London, 1723. Britannia standard (95.8% pure silver). Hallmarked to underside of base. Size: 4 1/2 inches Ht. X 2 1/4 inches diameter. Condition: dent to one side. English George III period sterling silver oval tea caddy, London, 1796, by John Crouch I and Thomas Hannam. Size: 4 inches high x 4 inches long x 2 1/2 inches deep. Excellent condition with no repairs or damage. Engraved on the front with a family crest. 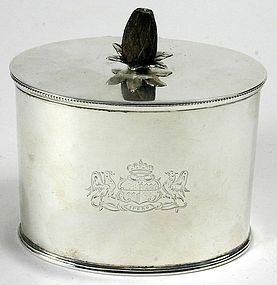 Fully hallmarked on the side and also on the lid with lion passant and maker's stamp. The wooden finial is carved and is secured to the cover with a sterling nut. Gorham sterling silver child's place setting in Zodiac pattern, including fork, spoon and knife, bearing the Pisces fish symbol for February. Patented 1894. 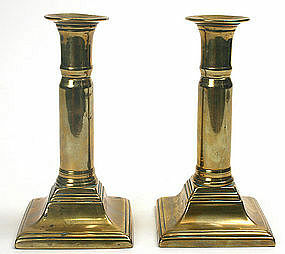 Engraved on handles with initials "E.H.L.S." Size: Fork - 5 5/8" Spoon - 5 3/4" Knife - 7 1/4". 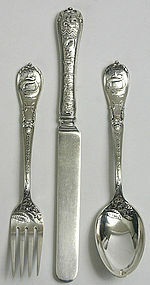 Laconia, NH coin silver serving spoon by R. Gove with shell shaped fluted bowl, monograms, c.1850s-60s, 8" length. Excellent condition. An unusual form and maker. 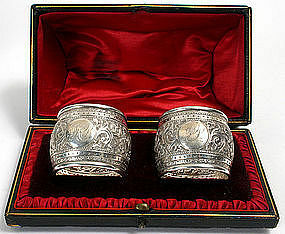 Scarce pair of antebellum New Orleans coin silver repousse decorated goblets by Christopf Christian Kuchler. Circa 1855. Engraved 'P. Irwin' for Patrick Irwin (1810-1878), a prominent citizen of New Orleans and Alderman, Louisiana State Representative, and co-founder of the Hibernia Bank. Retailed by Hyde and Goodrich of Royal Street. Size: 6 inches ht. Excellent condition. Makers mark stamped to underside of foot. 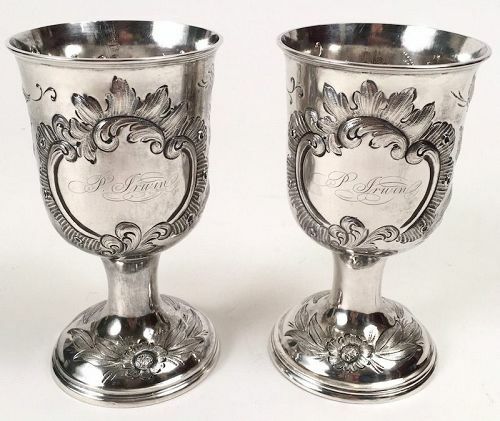 Pairpoint centerpiece in silverplate with cut crystal vase, fashioned in a classical style with female masks and garlands, and supported on paw feet. The removable crystal vase is decorated with diamond cut motifs and has a star in the base. Circa 1890-1915. Condition: Two small chips to the crystal (one on top rim; one on underside of base). Marked on the underside with Pairpoint stamps and the number C1536. Size: 7" x 7" x 16.25" ht. Tiffany and Company sterling silver large stuffing serving spoon with family crest. Size: 12.25" long. Circa 1902-1907 (Charles Cook's directorship). Stamped with pseudo hallmarks as well as with the Tiffany & Co. sterling stamp. Excellent condition, with only some superficial scratches.